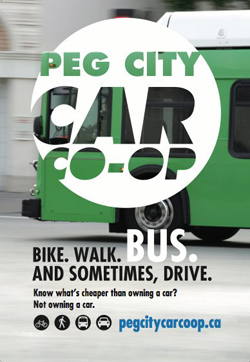 The Winnipeg Car Co-op is a carsharing service that helps you meet your transportation needs off campus while allowing you to commute by transit, cycling, and walking. Joining a car-share means having access to a fleet of vehicles 24 hours a day and only paying for what you use. Save thousands of dollars a year off the cost of owning and operating a vehicle! It's easy! All bookings are conveniently made online and managed using specialized in-car hardware. Usage is charged on an hourly and per kilometre rate, billed monthly. At the end of a booking, vehicles are returned to the same parking spot - like a library book that you borrow and then return. Individual or Department Memberships: To access the vehicles parked on campus, you can apply to become a member of Peg City Car Co-op or sign up as a 'Casual Driver'. Memberships are available to individuals as well as to departments who can use the carshare as a replacement for a company fleet vehicle. Within departments, individuals have the option to join under one membership and add drivers to a shared account. Departments will receive a monthly invoice, with details of costs broken down according to driver. Drivers also receive a record of their trip by filling out an in-car log. More Information: For complete information about fees, locations of vehicles and member eligibility criteria, visit the Winnipeg Car Co-Op website or send them an email to learn more about this amazing service!